Growing up as a dancer, I used to run straight from school to hours of rehearsal and would often just grab what was quick. There may or may not have been a shorttime period where I skipped multiple dinners each week purely because I didn’t have time. Though I rarely resorted to the fast foods we are so often warned about, my nutrition routine clearly had room for improvement. I wish I could go back in time and give my parents this book! 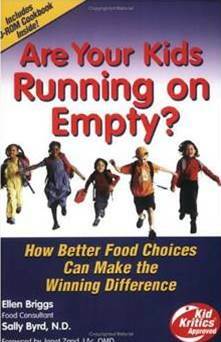 Are Your Kids Running On Empty? is jam-packed with valuable and interesting information, including everything from how to entice kids to eat their veggies – they’re always veggies, not vegetables – to the science behind everything that makes up what we eat. I particularly liked reading about how different foods fuel different parts of our body, and I know parents will too. I think my favorite part of this book, though, is how it makes these lifestyle changes so appealing and most importantly, attainable. By being so comprehensive, authors Ellen Briggs and Sally Byrd, N.D. do all the hard work and research for you, so you can just focus on implementing the techniques and reaping their rewards. This awesome book is all about the simple, small steps that end up making a huge difference in how kids feel and perform on the field, on stage, and in the classroom. I promise, your kids will thank you later!